Hone Landscape Company offers Issaquah landscaping including design, landscape installation, and renovation. We design and install landscaping in Issaquah for new construction homes. In addition, our renovation projects transform landscapes for people who have just moved into a home and want to make it their own, or want to update their property to make it more usable or enjoyable. The professional Hone team takes care of everything from start to finish including; grading and contouring, irrigation, patios, walkways, driveways, retaining walls, fencing, lighting and of course installing lawn, plants, and trees. Our crews have an excellent working knowledge of all aspects of landscape construction. We have extensive experience using materials like pavers, rock, flagstone, and stamped concrete to build beautiful sidewalks, patios and driveways. 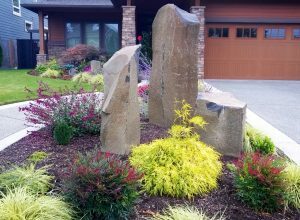 Rock outcroppings can add visual interest to any outdoor area. A retaining wall can be a structural wall, but it can also be a great way to add visual interest to your project. We specialize in using stone blocks, rock, and other materials to create walls in yards and gardens. We can also engineer structural walls to meet your needs. Draw on our professional experience with creating and constructing drainage systems to fix problems like soggy yards, buildings, and parking lots. Our team provides construction impact mitigation and other landscape mitigation services for construction zones and natural areas. Jason was very prompt in coming out to review our project and give us an estimate. Additionally, he was very helpful in finalizing our landscaping plans and responded quickly to our email questions concerning the bid. His bid price was in the middle of the bids we received, but based on our research the bid seemed very reasonable. That and his willingness to help us to get to a final landscaping design we were happy with made the difference. His work crew was very professional and efficient, showing up each day promptly and cleaning up thoroughly each day after work. The crew worked extremely hard and was very friendly. Jeremy (the foreman) always took time to explain the daily work plan/schedule and answered any questions we had. We would like to learn more about your project. Call Hone Landscape Company at 425-549-0185 or contact us online. Project estimates are always free.